Sitemap to all pages covering the state of Mississippi. Contributions and photography for the Mississippi guides from Alex Nitzman, Andy Field, Brent Ivy, Carter Buchanan, Justin Cozart and Trevor B. One and two digit state routes are primary and orientated with the lowest odd numbered route running north-south from west to the east and the even numbered routes assigned to east-west highways and counting upwards from north to south. There are some exceptions. 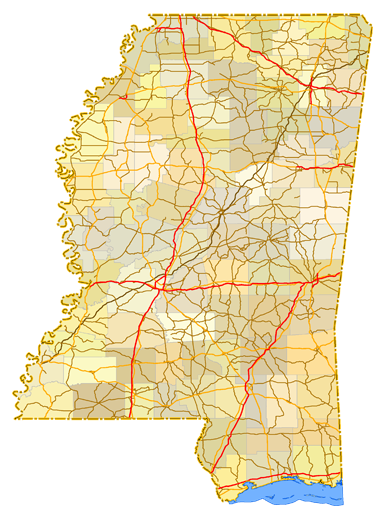 Mississippi also utilizes a route clustering system for the numbering of three-digit routes. These range from the 300 series at the northern end of the state to the 600 series within the Gulf Coast counties. 100 series numbers are reserved for former alignments of U.S. Highways and act as business loops or alternate alignments to the parent US Route. Mississippi 245 is an exception to this rule as it represents an old alignment of U.S. 45 Alternate. Unsigned highways are legislative in nature and range in the 700s, 800s and 900s, with a clustering system from north to south similar to the 300-600 series. Signs for these routes appear occasionally throughout the state. Source: U.S. Census Bureau, 2010 Census Redistricting Data Summary File. Page updated March 25, 2019.